A team is made up of one Captain and 9 registered players. Of the 9 players 7 are active players and 2 are designated as substitutes. The Captain can join his team as a player. In the beginning of the series there has to be 7 players in the field and 3 women. 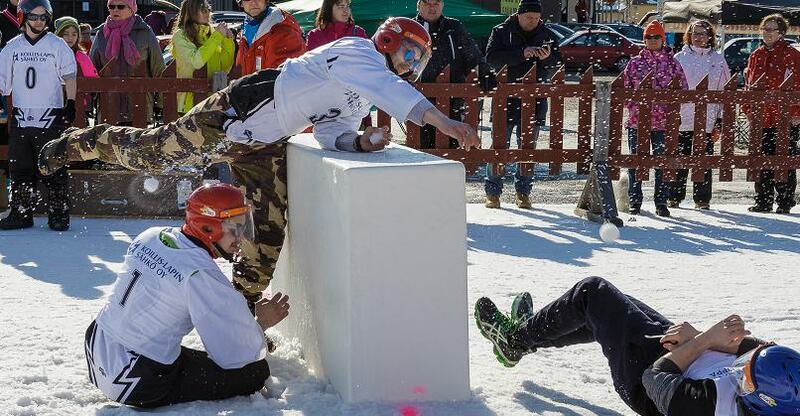 The purpose of the game is hit the opposing team member by snowballs. The standard time for one period is 3 minutes (3 periods/ game). The time passed until the resumption of the period does not count as part of actual period time. The first team to win two periods wins game. Team information will be taken to competition office 30 minutes before the beginning of the first game. Teams can only use these named players during the tournament. You can change the opposition of the players freely between sections. Headreferee can check the team information anytime during the matches. Whether there are some changes in the teams, the team will be sent out of the tournament. The snowballs will be made by the special machine. 90 snowballs/ period and 270 snowballs/ game. Making snowballs starts 30 minutes before the game, and team has 15 minutes time to do snowballs. Helmet afficed with head and face protection are compulsory and number tickets will be given by the organizer. Shoes may not have spikes. Team shall wear similar costume. Team flag shall be made of cloth and be 50cm height and 1m length. Flag poles shall be 2m length. Each player takes care of his own insurance! Is available by the organizer of the competition. www. yukigassen.fi. The rules will be delivered to the players before the tournament. The best teams (1-3) will be awarded. Other awards include: Best costume and Best Fair Play. 1. A team wins section, if within the allotted time they capture (pull out) the opponents flag. 2. A team wins section, if within the allotted time all of the members of the opposing team are declared out. 3. If time runs out before a winner has been decided, the team with the most players left on the court is declared winner. 4. If time runs out before a winner has been decided, and each team has the same number of players remaining, the period is declared a tie. 1. The first team to win two periods wins the match. In the event that three periods are played, and two of the periods end in ties, the winner of the one decided period wins the match. 2. If both teams tie in the third period, total points for the three periods will be calculated and the team with the most points will be declared the winner. 3. If both teams tie in the third period, and at the end of the third period the points total for the match are the same, a winner will be decided by a winning throw (WT). 4. The method for the WT is as follows: a target is placed on the chateau and each team chooses in the last period on the field being five players, from which at least two women. (principal: man-woman-man-woman-man). From just behind the back line, teams altenate having one of their players at a time to throw one snowball at the target. The team with the most knockdowns off the target of the chateau wins. 5. If the play is still after that a tie, teams choose one man player and the one who hits first to target wins the whole battle. The thrower cannot be one who has thrown before. 6. If the play is still a tie, teams choose one woman player to throw and the principal is the same as in above (point 5). 7. If the play after all is still a tie, teams choose one player and the throws continues as long as either of teams hit the target. In this stage the thrower can be the same all the time. The winner of the WT get one section point.